Orbit's automatic irrigation valve has an easy-access screw-top lid. 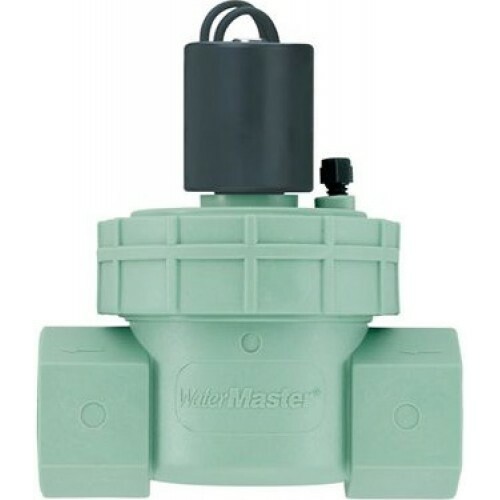 Its simple and dependable design includes manual operation and a standard 24-volt solenoid for connection to an irrigation timer. Can I use my solenoid valves off a gravity feed? Unless your tank located is upwards of 20m above your valves, gravity feed will not provide enough pressure for your valves to reliably open & close. It is not recommended. How many solenoid valves should I use? The number of solenoid valves you use depends on the size of your garden & the flow output of your water supply. The number of litres per minute that are available will determine the number of sprinklers or drippers you can operate at any one time. Once your garden is divided up into each section using that information, you’ll need one solenoid valve to operate each one individually. My solenoid is staying on, how can I fix it? Nearly all of the time, a solenoid valve staying open is caused by debris caught in the diaphragm. Even the finest debris can cause the valve not to seal shut, causing a constant leak. Other cause can be: Not enough flow because the irrigation zone is too small or, not enough pressure, the valve needs the pressure to seal shut. What is a master valve, and do I need one? A master valve is installed upstream of the solenoid valves being used to control each irrigation zone. They’re not mandatory, but they are a good idea as installing one increases the life-span of each valve by protect the valves downstream from the constant pressure that would otherwise be applied. The way it works is, every time a zone is programmed to come on the master valve also switches on, providing the flow, but when all the zones are off, the master valve closes, holding back the flow & pressure of the water supply. Simply, it’s kind of like an irrigation insurance policy. A solenoid valve is the automatic tap that controls that flow of water to an irrigation zone. Solenoid Valves are automatically operated by an irrigation controller which is programmed to tell the solenoid valve when to open & close. No Power? No Wiring? No Problem! The new full-featured isolation timer/valve combo provides up to a year of automatic operation on one set of standard batteries. Installation is simple and the timer utilizes Orbit Easy-Set programming logic. Controls up to 4 valves Rain Delay Rain Sensor Capable No power needed / Runs o..